Two-Face is a gifted mastermind obsessed with the number two, his criminal motif. His every decision is determined by the flip of a two-sided scared coin, which is also the source of his greatest weakness. Weapons may include nickel plated 9 millimeter pistols, 45-caliber pistols, machine guns, Mini Uzis or even a chainsaw. History: As Gotham's youngest and brightest District Attorney, Harvey Dent formed a united front with Police Commissioner James Gordon and the Batman to bring justice to the city and curb organized crime. In a packed courtroom, indicted crimelord "Boss" Maroni repaid Dent in kind by hurling acid at the young D.A., horribly disfiguring the left side of Dent's face and fracturing his psyche, already tormented from a childhood of violent abuse. 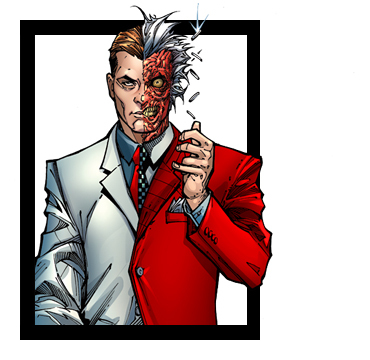 In that moment, Dent became Two-Face, a sociopath whose murderous actions were dictated by the flip of Dent's own good luck charm, a two-headed silver dollar he scarred on one side to reflect his own split personality. 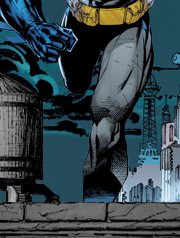 Obsessed with the number two and his own duality, Two-Face established a criminal base in Gotham and repeatedly clashed with its Dark Knight, despite the Batman's best efforts to rehabilitate his former friend.